From Twain’s portraits of the river and its denizens to romantic photo essays, environmental analyses, and personal memoirs, a river of words about the Mississippi have flowed through the nation’s literary history. It’s an imposing torrent in which to launch an account of generations of legal and political actions that have shaped the ‘river’ as we experience it today. Some might think that a book on water resource law, its evolution over generations and its effects on landscape and human culture would be dry, obscure and hard to read. Very much to the contrary! Authors and attorneys Christine Klein and Sandra Zellmer (self described “Mississippi River children”) spin a highly readable account from the mistakes, blunders, miscalculations, misunderstandings and sheer stupidity or ignorance that have been imposed on the mightiest river of our continent and the people who have tried to control it and those who live along it, with it. Klein and Zellmer follow policy evolution from the Corps of Engineers “levees only” management of rivers for navigation to the wholesale fortification of the mighty stream with locks and dams creating a ”Stairway of Water” from the river’s headwaters to its confluence with the Ohio River at Cairo, Illinois. Dams with mammoth reservoirs were built on the main stem of the Missouri River, primary tributary of the Mississippi, to hold back (in theory) or slow down run off from excessive rain or snow melt. Relief valves, called floodways, another ‘tool in the flood-control toolbox’ were conceived following the floods of 1937. Their function was dramatically illustrated in 2011 when the Corps dynamited Bird’s Point levee in southeast Missouri to lower a flooding Mississippi, thus ‘protecting’ the more valuable town of Cairo, Illinois. Residents of tiny Pinhook, Missouri on the other hand were flooded out, along with 130,000 acres of productive farmland. 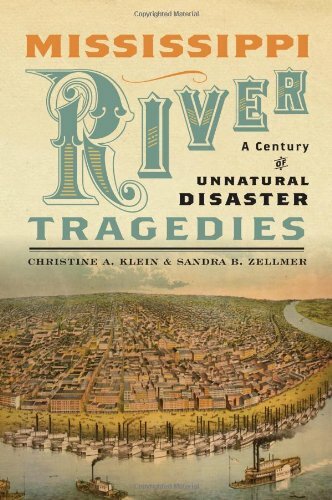 After setting the stage of how the Mississippi became an “unnatural river,” the authors recount decade by decade the ‘natural’ disasters that led to legislation aimed at controlling the power of an immense watershed, and the expanding authorities of the Army Corps of Engineers, the federal agency charged with engaging in battle with the river monster. With the new authorities, Congress provided the Corps legal immunity from liability if floodwaters caused damages in spite of their engineering efforts. Congress attacked the problem from non-engineering angles as well, expanding disaster assistance programs and establishing and funding the National Flood Insurance Program despite private sector assessment that the risks of insuring flood-prone properties outweighed the benefits (profit potential). These programs combined to allow, even encourage continued development in areas the river once claimed as its natural floodplain. The authors illustrate legal concepts through case studies and court proceedings bringing into sharp focus how the workings of government and the judiciary impact the daily lives and fortunes of citizens. Immense ‘natural’ disasters from river risings (the 1927 Mississippi River flood and those of 1937, the early 1950s and the Great Midwest Floods of 1993) to hurricanes Betsy and Katrina, are eye-opening tales of legislative reaction, engineering blunders and mismanagement, the evolution of judicial interpretation of laws and policy, and lessons not learned or not implemented. Other recommendations include changing the National Flood Insurance Program or turning it over the private sector to write actuarially sound policies; eliminating immunity for federal agencies – i.e. the Corps – for negligent acts causing flood damage; reforming the metrics used in justifying flood control project – i.e. the easily manipulated cost-benefit analysis used to justify major projects; give nature (rivers) some space to expand and contract in response to seasonal or weather condition. Theirs is a reasoned and researched account of official policy, legislation, and judicial decisions that have led to the myriad unintended consequences we read about in headlines nearly every spring. Klein and Zellmer pull back the curtain on Mississippi River “management,” but behind that curtain they don’t find a genial wizard of water resource development. Rather, they uncover a complex story of political, judicial, bureaucratic and scientific confrontation that continues in the courts today. It’s a fascinating account of the river we thought we knew and how it got that way. It is good to see another book – like John Barry’s Rising Tide – that acknowledges that river management is a confluence of hydrology and politics and culture. In 2012 Congress passed a law to reform the National Flood Insurance Program and return it to solvency. Biggert-Waters put in place actuarially sound insurance rates that would reflect the real risks of living in flood prone areas. Following Hurricane Sandy, politicians scrambled to respond to the ire of voters whose insurance rates were about to go up significantly. On March 21, 2014, President Obama signed the Homeowner Flood Insurance Affordability Act of 2014 – repealing many of the reforms contained in Biggert-Waters.